Beauty books that I've read in the past seem to leave me feeling a bit 'meh'. Not in that they make me feel bad about myself, I just feel like they leave a lot to be desired. It's how I feel about most fashion style-guide books too. Anyway, I came across Pretty Honest online and tracked it down in one of Auckland's libraries and have spent the last couple of weeks devouring its contents and now I feel ready to rave about it..
Now Sali Hughes has been immersed in all things beauty for a long time, having been the beauty editor at many of Britain's top newspapers and magazines. It's safe to say she knows her stuff and Pretty Honest was filled to the brim with beauty advice you need from how to approach snitchy sales assistants at beauty counters, to the best beauty gifts to buy for someone else. It's really like one big beauty dictionary but way more interesting. Seriously, I read every section, even the ones that weren't as relevant for me and there was always something I could take from them. It's one of those books I can imagine myself going back to and steering both beauty newbies and lovers alike in the direction of. 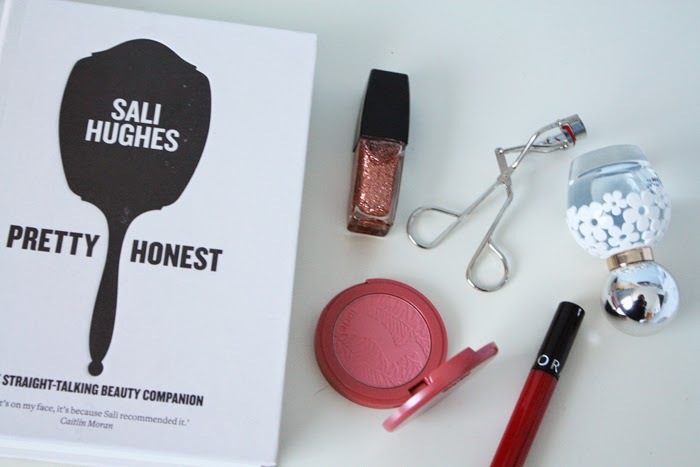 Sali, I take my hat off to you for making a beauty book that is useful, engaging and just an all-round fabulous resource. *Have you read Pretty Honest? What did you think of it? I've not read this, but it sounds good, maybe have to treat myself! I just ordered this off the BD last week, can't wait to read it! I need to treat myself to this one, sounds amazing!